Join in sacred ceremonies and practices connecting us to nature in Southern Utah this April. We will be intermingling with the elementals, the mountains and the waters, the trees, the canyons, stones and stars... heaven and earth. You will experience a merging of our hearts through mindfulness, movement, and music. With these practices we will feel a deeper connection with Pachamama, the divine cosmos and ourselves. As a child I had an affinity to trees and all beings, actually. I would mimic mourning doves, starting conversations with them, knowing that we did communicate on some level when they replied! (I still do this.) I would talk to many a praying mantis and be enamored when one would tilt its head to listen to me. I would be the one playing with a daddy long legs and taking the bugs from inside the house outside to rescue them. (Old habits never leave, I am still the one doing this.) I would collect tadpoles and watch them transform into frogs. My sister and I, much to the chagrin of our mother, would watch them hop down the hallway in our house. I had a deep connection with our family pet, Cookie, spending much time with her during her seventeen years. I even taught her to speak the words, "Mama", "I love you" and "I am a good girl". I would spend hours in nature with the trees, walking among them, touching them, talking to them, reading under them and taking in their healing. I had a very cool rock collection, still do! When I contracted ulcers and digestive issues as a teenager and again, later in my twenties, no Western medical doctor could give relief. I needed to look elsewhere. I connected with mature and felt better. This was bolstered by my experiencing the healing arts through various practitioners. I believe my thirst for knowledge in this field began with the book, Conversations with God. Why couldn't anyone have a conversation with the Divine? We all can! We have a connection that has sadly been lost in our society. We need to remember the sacredness of self and our connection to all beings, the ancestors, guides, and the Divine. I have been a student and teacher of the healing arts officially since early 2006 when I won a door prize for a Reiki session while attending a women's conference at Unity Church in Lincroft, New Jersey. This led to my learning that subtle energy healing modality and many more. Since then, I am blessed to have learned an array of healing tools to magnify joy, blessings and love. 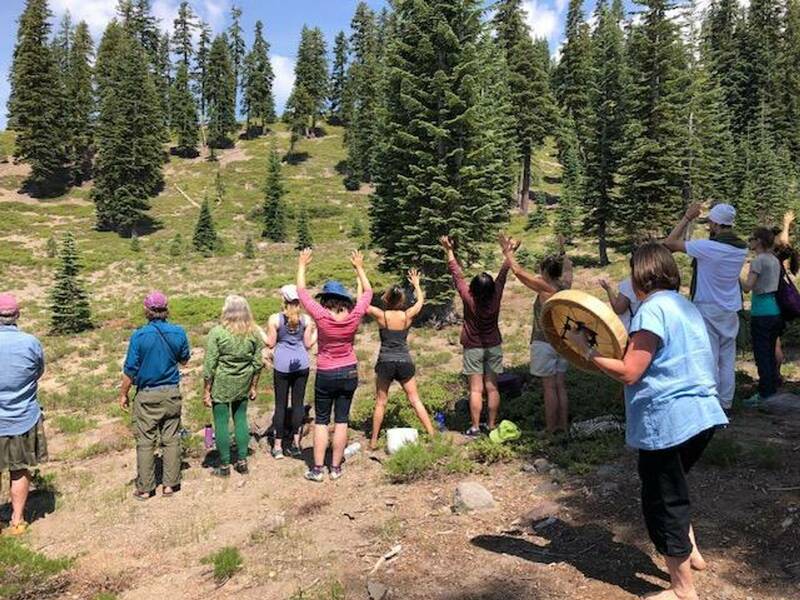 I am a certified drum circle practitioner through Remo and Healthy Rhythms, a certified Reiki Master/Teacher, a Shamanic practitioner, a certified teacher of Mindfulness, a Healing Rhythm facilitator, a certified sound healing practitioner, and a certified Qoya teacher. I am also a certified teacher of English and Special Education having taught in both private and public middle schools and high schools in New York and New Jersey, as well as at Wagner College in New York. I have used a variety of healing modalities as a form of stress relief with my students for over thirty years. I am honored to have studied and taken multiple classes, training's, certifications and several apprenticeships with renown teachers such as Christine Stevens, the late Don Campbell, Vicki Dodd, Deepak Chopra, Diane Todd, Zacciah Blackburn, Rochelle Schieck, Rosie Warburton, Marco Dolce, Kristen White, Cyndy Paige, Adam Kane, Al Romao, Sean Fargo and Dr. Chris Willard. I have taken classes and become certified through PESI Inc., Remo, The Reiki Institute of America, Mindful Schools, Mindfulness Exercises, and Mindful Educators at Blue Cliff Monastery. I am currently enrolled in the Holistic Health Masters program at Georgian Court University and loving it! This background gave me a healing toolbox to share with you. Ask yourself what you need and see which modality offered will help you. Look around my website and if you have any comments or questions, please feel free to contact me. Thank you for perusing my site. I hope to see you again. Check back later for new updates to this website. There’s much more to come! There are an array of reasons as to why people seek alternative or complimentary health therapies. No matter what your reason, I am poised to help you learn more about your options. Here you will be gifted with the ability to experience a variety of healing modalities. 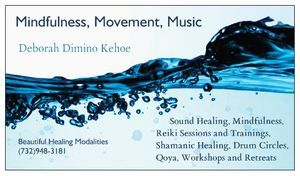 At Mindfulness, Movement and Music, I am focused on providing beautiful and sacred services to you. My goal is to spread joy, blessings and love through the modality which resonates most with you. Choose from one of the many offerings. I am sure you will thankfully find one to suit you. I offer private healing sessions, classes, workshops, shares, Qoya movement classes, wellness days and retreats. I would be honored to be a part of your life journey.